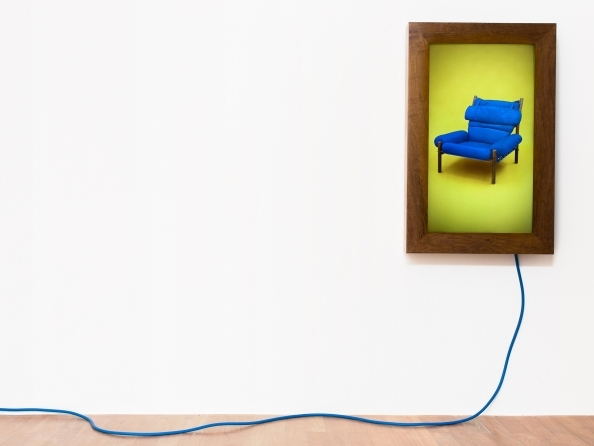 Luis Gispert, Nappy Light, 2012, Print, 40 x 30 inches. Rhona Hoffman is pleased to present Pin Pan Pun, our second solo exhibition by artist Luis Gispert. Working within the fields of photography, sculpture, and video, Gispert has been widely recognized for his distinctive portrayal of cultural stereotypes and fantasies. In this current exhibition, a linguistic artifact is the starting point for a new chapter in Gispert’s re-telling of social desire and secret histories. Pin pan pun is Cuban slang for a foldaway bed, a trundle or cot. The phrase is an onomatopoeia describing the three-step process of the bed’s assembly. Each syllable represents one of its steps: Pin, the fastener that keeps the bed folded is undone. Pan, the bed opens and flattens out. Pun, you lie down. In Cuban exile communities like the one in which Gispert grew up, the pin pan pun was a popular household accessory. Pulled out of closets and garages and assembled awkwardly in living rooms, it marked the arrival of the recently immigrated relative. The pin pan pun was code for surprise visits, news from afar, for stories to be told late into the night. 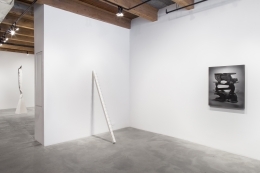 With this new body of photographs and sculptures, Gispert moves inward, into a home full of unexpected visitors, strange bedfellows, and chance meetings. 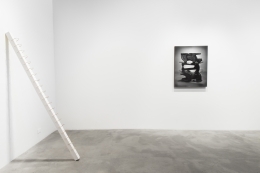 A series of silver gelatin prints depict studio-constructed compositions photographed with an 8x10 camera. The images are mounted upon boxes whose sides refer to the color or material of the represented objects. In Simpleton Badness, the ubiquity of a Noguchi coffee table is literally turned upside down by two black panthers. Re-combinations and intersections also figure into Gispert’s sculptures. In Narrowcaster, the viewer considers a 6-foot sugarcane stalk spearing a 22 karat gilded coconut, poised upon a laminated fiberboard base. A Hydro-Stone curb finds itself pierced by a spine-like series of 4-inch hoop earrings. Sculptures point to an archaeology or history: imitation gold rope chain is excavated, carved, and shown in relief. 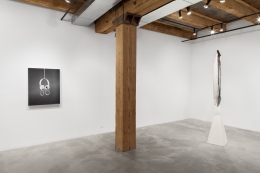 Rhona Hoffman Gallery is located at 118 North Peoria Street, Chicago. Gallery hours are Tuesday–Friday, 10 am–5:30 pm, Saturday 11 am–5:30pm. The exhibition is free and open to the public. Please contact rhoffman@rhoffmangallery.com for further information. Born in New Jersey in 1972, Gispert received his BFA in Film from the School of the Art Institute in 1996 and his MFA in Sculpture from Yale University in 2001.